I have a rather pricy Surface (great birthday present), but I don’t want to spend that much on a tablet for the kids. So when I heard about Venturer tablets coming in at less than £150, I got a little excited. But when I heard that they were survived undamaged in a drop test, I got more excited. There were tested alongside the Surface 3, Lenovo and Asus devices at heights of 0.7m and 1.2m in a factory drop test which involves dropping the same device on at least 6 different sides and corners. The only tablets that passed at 1.2M were the Venturer ones. Let’s just say we’re a clumsy family, so maybe a good solution for us! So I had to find out more. 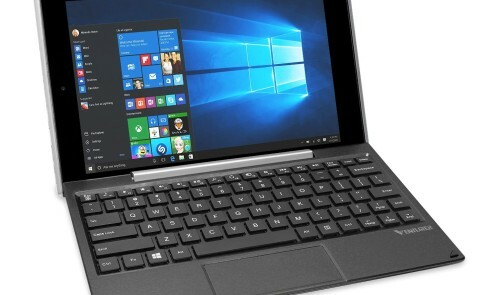 The BravoWin and EliteWin are both a tablet and laptop, well they are tablets with keyboards. I had to get a separate keyboard for my Surface, which is annoying! “Easy to use and incredibly durable” say the manufacturers, the Venturer Tablet is ideal as a first tablet for students heading to secondary school, college, university or even home use. With its sleek, light weight design, and long battery life, the BravoWin 10KT or EliteWin 11KT are ideal for work or entertainment on the go with up to 8 hours usage whilst travelling. 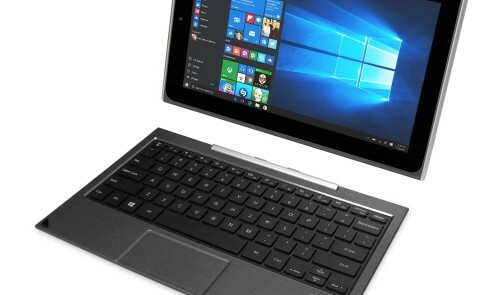 The Venturer convertible tablets are equipped with a detachable smart keyboard that has a pressure sensing trackpad which clips on magnetically so it can be used as a stand-alone tablet or quickly transformed into a working laptop, making it easier to type, work and surf the internet. Here’s the tech bit – with an Intel Atom Core 4 processor, 2GB RAM and 32GB of memory, they offer a quick and responsive user experience with the ability to access the internet within seconds and an expandable storage space for photos, videos, music and work files. The 2MP dual cameras allow you to take photos or videos, skype your friends or a make a conference call at work producing good quality images and videos. 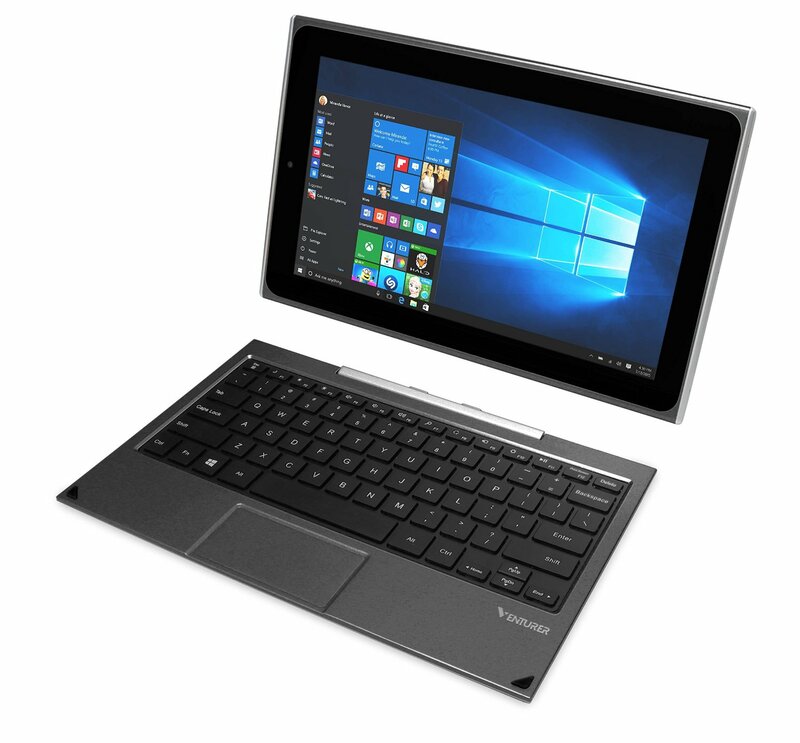 The BravoWin 10KT has a 10.1” 1280 x 800 display and comes with all the key software from Office Mobile you require, including Word Mobile, Excel Mobile, Powerpoint Mobile and OneNote. The EliteWin 11KT has a larger 11.6” screen with 1366 x 768 display and is fully loaded with the latest Windows 10 software and a month’s free trial of Office 365 (Word, Excel and Powerpoint) making it an ideal laptop for any school or office environment. With a headphone, micro and regular USB port to attach or charge other devices and an HDMI output allowing you to easily connect to your TV for an enhanced viewing experience, the Venturer tablets have all the necessary outputs for a great multimedia experience. Priced at only £149.99 and £199.99, the Venturer mini notebooks are a good choice for those looking for the flexibility of a tablet and laptop combined, a lightweight device that easily fits into a schoolbag or work satchel with the quality, reliability and durability for work, for play, for every day.